Most business owners never look at their cash-flow statement. Even for me, as a professional accountant, they can be rather cumbersome to create and boring to look at. 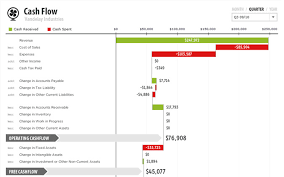 Finally, we have a cash-flow report format that you can really see. A cash-flow report that puts the color back in and takes the word flow placing it in the context of something like water flowing down a waterfall. The reporting system we use, created by Fathom (Australian software company) really makes cash-flow statements look beautiful and easy to follow. You see, most business owners are really, really focused on the Profit and Loss Statement. And, that’s a good thing, except the Profit and Loss Statement does not equal cash-flow. You can make money and actually go broke, so keeping an eye on your cash-flow is critical. What are the elements of a cash-flow statement? 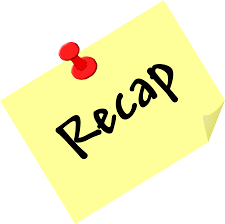 It starts with – your sales – how much revenue did you bring in. And it shows it at the top of the “waterfall”, in a band of green color, like water starting at the top of a cliff, flowing downwards. Next – in a band of red color are your direct expenses, or cost of goods sold. This is your first main outflow of money, so it is in red. After that is your general operating expenses, or overhead. It, too, is in a band of “red”. This equals your net profit, and, of course, as you know this is not really your cash-flow. We have to adjust it. 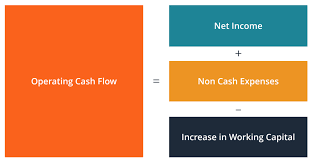 (Side note – Can cash-flow ever be equal to net profit? Yes, it can, in rare cases. When all your sales are cash, and all your expenses are paid in full, out the bank, that month, or period. But that is rare). 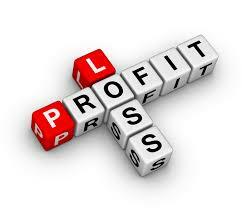 Now, we have to adjust the net profit to get to cash-flow from operations. We get to that number – imagining the cash now flowing in as a green color and out as a red color as the funds flow down the waterfall from top-to-bottom. We first add back the positive or negative change in accounts payable. In other words, if our accounts payable increased, that is a source of cash, and will show up as a green band, flowing in. On the other hand, if we paid off a lot of accounts payable and it went down, then we would have the red band showing a negative effect on cash-flow. The exact same holds true for accounts receivable and inventory. If our receivables went down, we have a nice green band showing money coming in, if they went up, it will be red. If you are good at “turning” your inventory and it went down, it, too will be a green flow of cash coming in. We do this for all changes in the business’ working capital (it’s current assets and current liabilities). The items that you invested in to grow your business – things like capital assets, or intangible assets. These are usually red items as you invest in capital assets. It could, however, be green, if you have sold capital assets. 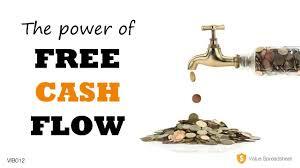 We have now arrived at Free Cash-Flow. This term is used because it is the cash that is available to pay to the suppliers of capital – the lenders and owners. From there, we deduct any long-term loan interest, dividends, and these would show up in red. The green cash inflows would be new financing or owner injections. Finally, we arrive at Net Cash-Flow. When you add this dynamic number to your opening cash bank balance then you arrive at your closing bank balance for the period.